In today’s world, there are so many platforms and mediums that a brand needs to be present (and active) on. This is why it’s so important for your brand to have a clear voice with a consistent look and feel that customers and followers can quickly and easily recognize. Every day we are bombarded with thousands of different messages; this means that a brand needs to be instantly recognizable wherever and whenever it is seen. Over the past decade, branding has evolved into something much more complex than it once was. Gone are the old days of traditional media such as TV, print and radio being the only messaging portals out there. There are so many additional platforms and touch points for your brand to consider nowadays. This can be good or bad, depending on how organized your brand is. Before jumping into understanding the true benefits of an organized brand, let’s first properly define what a brand actually is. First let’s start by defining what a brand is. We generally define a brand to be the set of mental associations that people have with a company, product, service, or with anything else for that matter. These associations drive how people feel about the brand. This is important to understand because it’s not just shallow, surface-level feelings that people have for brands. People identify with companies and brands and use them to represent themselves; whether it’s wearing a certain brand of clothing or driving a certain type of vehicle to project their personality to the world. For example, a woman wearing an REI down jacket is likely trying to project herself as being outdoorsy. The brand experience goes far beyond simply associating the brand with the product, it’s about creating an overall tone and voice for a company that people can relate to and see themselves as part of the lifestyle the brands experience. Now that we have a more complete understanding of what a brand truly is, we can dive into understanding the importance of creating a consistent brand. People tend to develop a preference for things simply because they are familiar with them. This is a psychological phenomenon referred to as the mere-exposure effect (Zajonc, 2001). What this means is that delivering a consistent and clear message to your customers is key. Again, because there are so many touch points and all of those platforms are littered with competing messages, a person needs to be able to recognize your brand in a split second. Below are some references to various academic studies. These studies prove that, in general, people like things they are more familiar with, and they will even pay premium prices for them. The first experiment by scientists was done using two words, “Mouse” and “Elephant” shown in two different fonts. People responded faster to the second pair because mice are associated with being small and elephants are associated with being big. Conceptually, the way the words were being presented was easier to process and the participants felt better about choosing the second option. This proves that the quicker we can process something, the more we like it. This second experiment reveals that options can be primed, meaning that showing something first that is related to the second object makes it easier to process. In this example, some testers were first shown a bottle of vitamins followed by a bottle of ketchup, the other set of testers were first shown a bottle of mayo followed by a bottle of the same ketchup. Then they were both asked how they felt about the ketchup. They found that the people who were shown the jar of mayo first felt better about the ketchup. 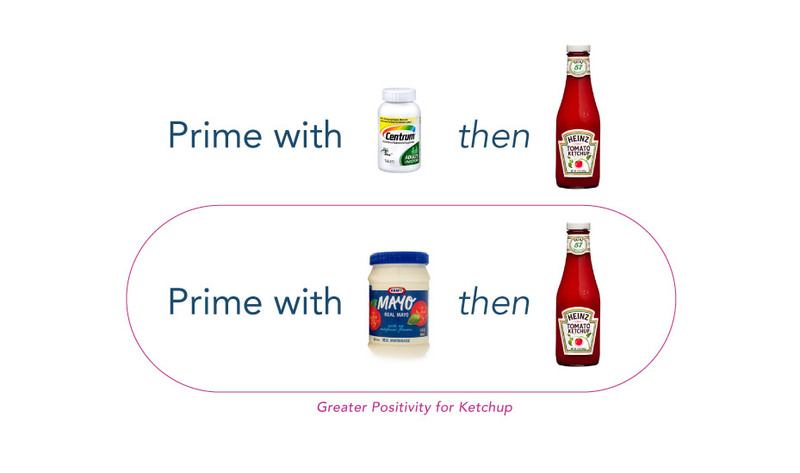 This is because the mayo and ketchup are similar to each other, and the vitamins and ketchup seemed random, and therefore were less liked. This last example was done using two shapes of bottles, one seemingly more luxurious and the other more casual. They also used two different types of fonts that have those same values (luxurious and casual). 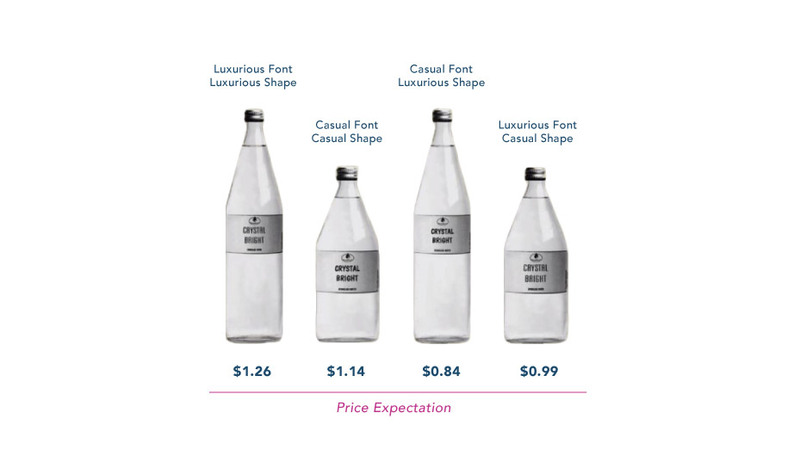 As you can see in the example, people were willing to pay more for the bottles which had font styles that matched the bottle styles, and even more for the seemingly luxurious font and shape, and less for the two bottles whose characteristics were mismatched. This is because when things match up and fit together, it increases likability. As shown in the first two examples, making choices easier enhances processing speed and likeability, and as shown in this last test, also contributes to how much we are willing to pay for an item. These examples illustrate the overall idea that brand consistency makes people feel better, which in turn can make them like the product better, and can potentially give a company the leverage to charge more for their product. A brand that is inconsistent makes a consumer start from scratch every time they see their imagery and can actually end up irritating people. Align with an archetype. There are 12 different archetypes, each having their own traits, discovering which archetype your business identifies with can help to determine if a company should consistently project being innocent, jester, lover or an outlaw. Gain or give access to assets. Give people creating the content and graphics the appropriate permissions to get to the assets in the brand guide. Does your company project a unified brand? If you’re concerned that your company does not, take a step back and observe how you are projecting your company’s voice and values. Does it seem disjointed or fractured? Is there a consistent message being pushed throughout all your channels? Take stock, and then make a plan to start projecting more cohesive messaging.